Our friend Al has done it again with unsurpassing clarity and grace! 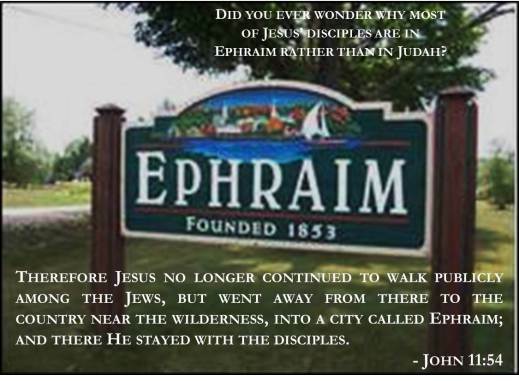 Strange things happen when disciples of Jesus (Yeshua) awaken to their identity as Hebrews. One phenomenon is that they begin to see the Two Houses of Israel throughout the Scripture from Genesis to Revelation. Judah (Yehuda) and Joseph (Yosef) have been rivals since the days of their youth, when Judah led his brothers in putting Joseph into a pit and selling him into slavery in Egypt (Genesis 37:18-28). By the time of their reunion over twenty years later, Joseph had become the leader of a foreign nation and Judah had become the leader of Jacob’s family. Their father Jacob formalized that division before he died, passing on the birthright and the family name to Joseph and to his son Ephraim, but giving the rulership to Judah (Genesis 48:8-22; 49:8-12; I Chronicles 5:1-2).